Sport Beans® jelly beans, introduced by Jelly Belly Candy Company and the world's first sports performance jelly beans, are now made with all natural formula. Sport Beans are flavored with natural flavors from fruit juices, use colors derived from natural sources and are naturally sweetened with evaporated cane juice and are free of corn syrup. Interbike attendees will be able to taste the new Sport Beans at the company's booth at Interbike September 23-25. 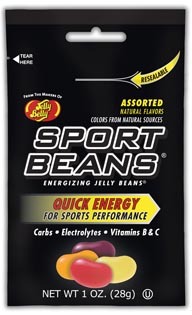 The popularity of the Sport Beans jelly beans among cyclists, triathletes, marathon runners and fitness buffs prompted the company to update the Sport Beans jelly beans line with new flavor and color profiles, plus new carb sources. Sport Beans are now made with tapioca syrup and evaporated cane juice replacing corn syrup and sugar. The four refreshing flavors of Lemon Lime, Orange, Berry and Fruit Punch - formulated to energize the body during exercise - are made with lemon, lime, orange, raspberry, apple and grape juices. Extreme Sport Beans, a caffeinated variety, available in watermelon and cherry flavors, made with real watermelon and cherry juices. In addition the company is introducing a new easy-open bag with a resealable zipper. The improved bag makes it easier to dispense the Sport Beans while running, biking, hiking and climbing. During Interbike Team Jelly Belly pro riders will make appearances at the booth and sign posters. Brad Huff, Will Routley, Matty Rice, and team director Danny Van Haute will be at the booth Wednesday 10 am - 5 pm, Thursday 11 am to 2 pm and Friday 10 am to 3 pm during Interbike. The first 50 people in line each day will receive Team Jelly Belly water bottles or T-shirts. Scientifically formulated for sports performance, Sport Beans jelly beans provides carbohydrates for energy, electrolytes to maintain fluid balance and vitamins to help burn carbs and fat and protect muscles against oxidative damage. Each of the six flavors of Sport Beans is packaged in 100-calorie single serving packets for portable power before, during and after exercise. The variety provided by six flavors allows athletes to select a favorite or to enjoy the range, escaping taste monotony. Additional information is available from Jelly Belly Hotline (800) 323-9380 or at www.SportBeans.com.